After keeping us in suspense for a couple of days a new clue is posted. 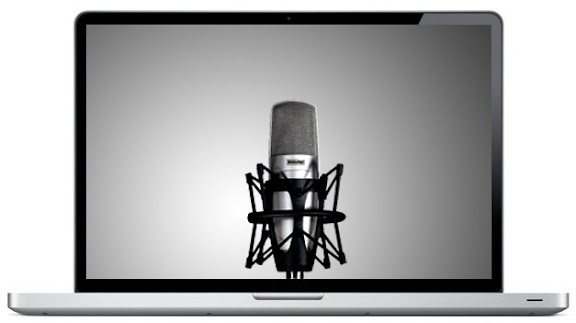 It is of a microphone on the computer screen of a Macbook Pro. The picture does appear to be a composite image, the Macbook image below is taken from the apple.com website and seems to be the same macbook picture, but the screen has been altered in the clue picture. 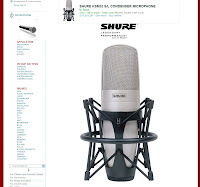 The microphone appears to be the SHURE KSM32 S/L, and the picture is taken from one of the many websites that sell this microphone. Thanks to peacock803 for mentioning the new clue first. Good morning, Zort! Let's see where this takes us. muschology, is it an air or a pro ? 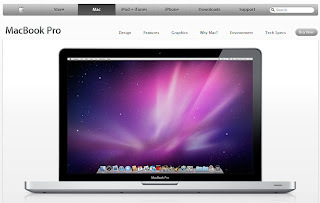 You could be right, the picture of the Macbook looks like it has been taken from the apple website. The same image is on there, but the screen shows a different picture, so this clue will probably be a composite image. It's a 17" MacBook Pro being you can see the four screws under the front edge of the unibody. Same as the PR photo available at apple.com/pr. The MacBook Air has a completely different shape altogether from the unibody MacBook Pro lineup. What this has to do with anything, I don't know. Hi. *yawn* Zort70, now I'm waking up in the middle of the night . . .
Glad to know that I can stop searching for that image . . .
Two guys, Mike & Adam? Do Mike and Adam present a podcast ? muschology, that's a particularly frightening avatar, or a reasonable likeness. Which? Neither really. Just a strange fear/fascination that there is something that big roaming around in the woods... Hungry. 10/19 at The Nerds of Comedy, LA 9 pm. Maybe it'll be an event at an Apple Retail store? The first pic is an apple, then the next one is a macbook. It could be announced at one of the iTunes gigs they have in Apple stores sometimes. @Zort, the comic pages and prints are from the collective DGPH that played a big role in the Buenos Aires reveal. Ned, I think the question is, which one ? New York given the 88-Keys connection or somewhere else ? There are 162 open mic events in New York tonight! Need another clue! Mike and Adam (and a second Adam) are all members of the Beastie Boys, which would also fit with the clues in the letter. If it's a podcast and they're showing us a mac pro laptop. Maybe it will be a podcast on itunes. I know that sounds fairly obvious doesn't it? Here are a couple of things said about the microphone at a website I was looking at. If you are a podcaster, musician, or active audio online chatterbox, run-don't-walk to your local audio dealer or Internet merchant and buy a Samson USB condenser microphone. In less time than it takes to read this sentence, you'll be recording or conversing in iChat, Skype, Garage Band, or Audio Hijack Pro. Musicians will love this microphone. Quiet or loud? Solo or combo? Vocals or instruments? Either way, audio is clear, unbiased, and immediate. Samson reminds MyMac.com: "Our Podcasting Paks have everything you need to get started in podcasting: USB Mic, shock-mount, desktop stand, cable and software in a durable, aluminum case. Could this be leading us to another hip-hop artist? Filmmaker Mira Nair discusses "Amelia," her upcoming biopic of the legendary aviatrix, Amelia Earhart. October 16, 6:00 p.m.
What does an apple store or apple event have to do with rhyming as a profession though? reAnimated I'd like to see a poster by Mike Mac, but I'm not sure how he would interpret a Lost theme. I like the Open Mic night at 88 Keys club in Seattle this Thurday. Just not sure how the Macbook fits in. Has anyone here received The Hatch yet? Still waiting on mine in Austin, TX. reanimated, I also have not gotten my hatch yet. But it is a rainy day after a government holiday, I am betting my postman is running a few hours behind. I hope for a lunchtime delivery if it comes in today. Oh yeah, I completely forgot yesterday was Columbus Day. Lame. This thing seems to have everyone confused! I guess the next hint will zero you in on what they're trying to say! Keep up the good work. This is probably heading the wrong direction, but I thought I would share that the tenth annual LitQuake is going on in San Francisco right now. Talk about professional rhymers! Also, as part of the event, on Thursday night there is an event called "Literary Death Match" and it is being judged by Amber Tamblyn who was on the short-lived "The Unusuals" on ABC with Harold Perrineau. Now I just need to find out if it's being podcasted. If the prize for this poster is going to be a Dharma Macbook Air, should I just glue my fingers to the F5 button now? haha, that would be sweet. reAnimated and ReverendMilo - has your Hatch status changed to Shipped? Mine still says Authorized, so I'm not even thinking about it arriving yet. This could be a lead to a radio station. Or maybe a podcast or a recording studio. With only two puzzle pieces of the mic and the computer, at this point maybe it will lead to Decon Records or Decon Media at 84 Wooster Street. #503 NY NY 10012. That is just a remote guess at this point. But I'll need another puzzle piece to see where it will really lead. Does anyone else get the feeling something has gone a little wrong? Posters still not dispatched and slow clue reveals, feels like something has collapsed and they are trying to re-organise stuff in the background. @knightsintodreams - I believe the connection was the 88keys bar in Seattle. @Martyn - Perhaps TPTB are just attempting to shift the timeline of these reveals to a different day. As well as, perhaps, dial down the excitement a little bit. @Mrs Z/reAnimated/ReverendMilo/everyone else - where are you guys looking to check on your status? I tried looking for a link i the confirmation emails I received, but could not find anything. maybe all of the hatch orders get an additional poster from DGPH :)Looking on the bright side. I'm thinking they are slowing down the poster reveals, to make #16 coincide with the Season 6 premiere. #1 - bardot - nightclub - Widmore? Yippee! Karen! Welcome. Great to see your comments here. We certainly are stuck for location! I did find the image for the mic and sent to Zort70 which confirms that Tyson has changed his methods or A. Miller is taking on more responsibilities at Ronie Midfew Arts. Someone needs to 'push the button' 'blow up the sub' or 'toss a nuclear device' and get clues moving. Zort70 just saw your Frame 9 alternate reality clue (ARC). Very funny. Maybe that will be my gelaskin! 1Milestogo I like your thinking. A box company would be the funniest. An a church? Interesting. Maybe Bardot is Christian Shephard for drinking? Widmore not in S1. I just got an e-mail from Apple announcing the grand opening of their new store this Saturday in Manhasset, NY. Seems like a long shot, but you never know. I'm off to a birthday dinner for Mrs Zort, back later. I do think New York will be a site of a reveal. Which one, I do not know. But New York plays a big part of our story with Rose-Bernard, Michael-Walt and so on. Happiest of birthdays Mrs. Zort! In the early '90's, 88' met A Tribe Called Quest’s front man Q-Tip, Pete Rock and producer Large Professor working as an intern at West Hempstead’s The Music Palace recording studio. It was Large Professor who gave Charles his 88-Keys moniker after witnessing his skills on the Ensoniq ASR-10 keyboard. on Wikipedia it also said - 88's parents and older brother began trying to point him into the field of medicine because it was a more "professional field" and the music industry didn’t seem like a lucrative move. I am wondering if the reveal will be at either the Music Palace recording Studio, or wherever the Death of Adam was recorded. 88 keys bar eh? hmm, i'm only 18 though....would they ID check at the door? Looking at the big size (thanks, RevMilo), I'm intrigued that the words say "Deus ex machine" and not "machina", as is the episode title and um, the way it's spelled. Happy Birthday Mrs.Zort! 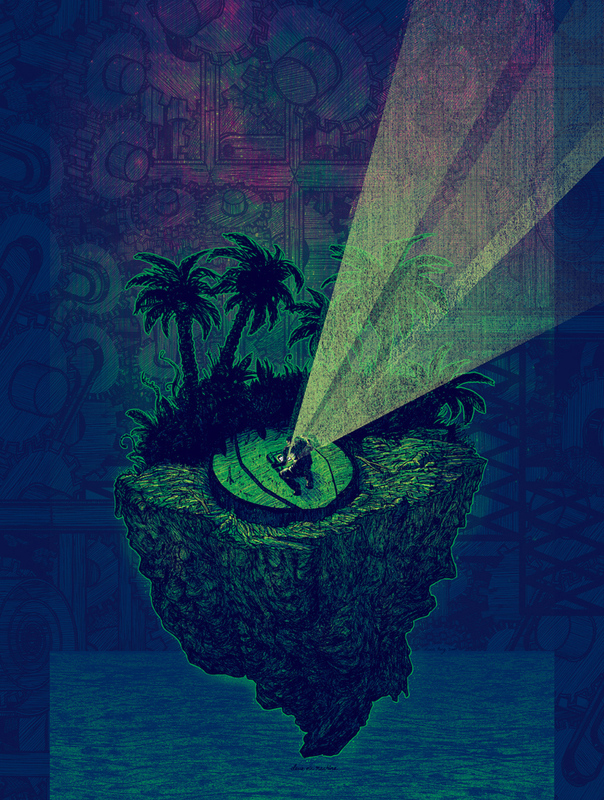 And thanks for being so patient while Mr.Zort keeps our ARG site going! We'd buy you a cake too if we could, to thank you. Cheezwhiz, I need to go out for groceries but I'm afraid I'll miss something. That's too weird. deus ex machine has an E in it. machina doesn't. aren't there random E's in the other posters? Amy Lynn, excellent. We need to add that to the mysteries of e's and a's, 4's and 5's . . .
My Hatch status still says Authorized. its weird, cause with Smokey I got the print maybe 5 days (4 mail days) after the order. Is anyone still waiting for their Smoke Monster print? Mine says shipped (not sure how long its had that status) but I have not yet received it. I got my Smoky last Monday. I am starting to get a little bit worried especially since it's the only one I've ordered so far and it seems everyone else has received theirs already. just wondering what time zone is this blog on? Pst mst etc? Ta. I'll just reiterate that most people received their Locke's Secret prints within a week or two, while it took me a month to get mine. I wouldn't be too worried Adam. Thanks, that puts me more at ease. Maybe it's a rebus. The picture is spelling "MicMac", the indian tribe who was located around Massachusetts. @Amy Lynn - I'm not so sure that it is an 'e'. Even in a higher res, the words at the bottom are still a little too fuzzy for me to definitively say that it is an 'e' an not an 'a'. Some cursive e's can look like a's and vice-versa. That really makes me feel better. I'm sitting up here in Wisconsin - so anything in Madison or Milwaukee (not holding my breath) I'm your guy. I agree with Jeremy, just zoomed all the way in with iPhoto on the highest res image available and it's still quite hard to distinguish but i do think it is an A. Also, I only just noticed Kevin Tongs signature to the right of the island. Still don't have my smokey either! Haven't received my smokey print yet, either. Back from dinner, very nice Venison Casserole, and good company. Mrs Zort (Fiona) says thanks for the Birthday wishes, and says she has nearly been caught in the ARG trap, since the last poster reveal she has been searching for clues as well. Happy Birthday, Mrs. Zort! We all thank you for allowing your hubby to be our fearless leader! Just to add I haven't got my smokey print yet, but the UK is usually at least two weeks behind on deliverys. Off to bed now, don't go revealing any URL's without me. I got my Smoke Monster print last Monday or Tuesday...I think one of those days. I'm in Boston, don't they ship out of California? Yes, all the prints come from CA. @feel_the_insanity - a fellow New Englander... sweet! Woostah, MA here. Good ol' Worcester (or as my friends from Connecticut call it War-chester). I actually don't live in Boston, I live in Woburn. But I tell people Boston because they always ask where is Woburn? Haha. P.S. So, we think maybe Thursday for the event/poster? Or does anyone think they'll sneak it up on us again and do it tomorrow? Not sure what to think anymore. Have a feeling that they're trying to really keep us on our toes. We're only 2 clues in... so maybe Thursday?!?! Woooooburn. From Groton here. JPL from Worcester? That's my husband's initials. But he's from.....wait for it....Lynn. Ah, yes the city of sin. You won't come out the way you went in. Next 'Mysteries of the Universe" segment is due out on the 15th. Do ya think this is slowing the clues to DCaaPB ? Here's 88's blog site. I just came across it via MTVu. There was a connection to rhyming so I put link above. 2 clues is all you see? Slow Death Comics every Comic author knows.. Microphone And Macbook makes clue "Co"
that'd be co mic book, to Sherman Oaks I'd go. Are any going to see Lindelof? @Eugene - New England is in the house & representin'... Woburn, Woostah & Groton. @Mel - we have to get you published. I'm finding you an agent. Damned if won't be a bestseller! My thinking - a podcast available throught iTunes. This mic is generally used for this purpose. I'm almost positive Sherman Oaks is the wrong reveal location. It doesn't add up to any of the clues so far. The only thing I can't reconcile with MEL's suggestion is the rhyming clue. Otherwise, I'm diggin' it. Maybe Lindelof will bust a rhyme at his signing and it will be podcast simultaneously. Totally no disrespect to Mel! I just feel like this "Sherman Oaks" is another "sports stadium" red herring, where someone gets an idea and everyone jumps on the bandwagon without looking at the actual clues. As MEL the wizard said: So ARG or not are any going to see Lindelof? I'm in the DC area, so I doubt I'll make it. Are there any takers in So Cal? what will it take for you to be completely? from Hawaii with no reveal for Damon. Until they link as listed..
Is there a doctor on this blog? Grab a bandaid and a splint. Order up 3 ccs of a local anesthetic and make it quick. Because our resident poet has had a most unfortunate slip. Mel - it was an accident... right? Because the pressure of waiting for the next clue is getting to us all. Unless it's come to this... a blood sacrifice?!?!?!? and what are the chances that Mr. Lindelof would sign a print, t-shirt or bookmark! Okay, I don't know if it's been mentioned, but perhaps we should be looking into Open Mic Night at the 88 Keys bar in Seattle... Friday at 6:00pm, 8:00pm on Saturday. And this looks intriguing, given the glue about rhyming: Soul Sunday (7:00pm) involves poetry... Of course, Sunday seems like a dreadfully long time to wait. CallieJo, that has been mentioned, but perhaps the mic in the mac is just meant to be a play on words. Instead of an open mac, its an open mic. Who knows? Anyone shaking in California. Earthquake! Didn't feel a thing in the LA area! Im pretty sure that the Sherman Oaks signing won't be the reveal, but Im going tomarrow night, but I don't have an IPhone, I do have my Room 23 blog set for Text Messages so I can do it that way if theres something important. Unless someone has another idea. I called Earth-2 Comics to confirm and they are still doing the signing. You don't have to buy Ultimate Wolverine Vs Hulk, but those who do get priority. Did we contemplate that the first clue is Adam's apple as n anatomy? And maybe shock jock. (that is a shock collar on the mic.). But I think MEL s gong n the right direction and we should all be prepared for tomorrow. Night. Send Tyson prayers if u get a chance. LOOKS like it will be Thursday! It says "Polo Life Thursday"
88 Keys blog is "I hear my Polo Lifestyle" right? Gotta be it! While your waiting for the hatch i'm still waiting for smokey. Hope tomorrow/today is the day. If 88-Keys is doing a show this week I still can't find mention of it anywhere online (and I've been trying since the first clue). I think the clues are pointing towards a live show with 88-keys... and that'd be consistent with the Numbers and Statue reveal. If it's here in NY I'll be able to go Thursday night... and I doubt it will cost much as it probably won't be a huge venue since there's nothing about it on TicketMaster or LiveNation. I guess we'll find out where he's playing tomorrow. I checked first thing this morning and there was no clue, I derive to work and look what happens ! I don't often derive to work, but today I thought I'd make a change from driving.